SAN ANTONIO -- Manu Ginobili scored 10 of his 16 points in the fourth quarter of what could have been his final home game with the Spurs, and San Antonio beat the Golden State Warriors 103-90 on Sunday to avoid a series sweep as coach Gregg Popovich remained out following the death of his wife. LaMarcus Aldridge had 22 points and 10 rebounds to lead the Spurs, but they were willed to the finish by the 40-year-old Ginobili, who has said he will decide in the offseason if he will return for a 17th season. Popovich missed his second straight game after his wife, Erin, passed away Wednesday following a prolonged illness. Lead assistant Ettore Messina led the Spurs again, but to a much different showing than in Game 3. Golden State outscored San Antonio 29-21 in the third quarter and went on a 13-5 run beginning two minutes into the fourth quarter to pull within 88-86 with 6 minutes remaining. 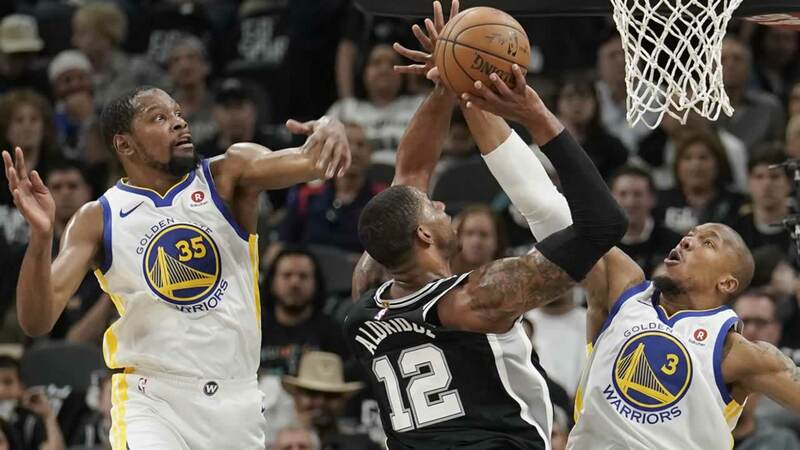 Aldridge banked in a 3-pointer with 4:22 remaining to stop the Warriors' run and Ginobili took over with a pair of 3-pointers in the final minutes. San Antonio opened with the same energy it had to start Game 3, but its shots fell this time. The Spurs extended their lead to as many as 17 points in the first half while holding an edge in almost every statistical category. San Antonio shot 53 percent on 3-pointers after shooting just 26 percent in the opening three games. The Spurs were 15 for 28 on 3-pointers on Sunday while the Warriors were 7 for 28.